سهیلی پور, اعظم, آزادی بویاغچی, مهرناز. (1397). تأثیر صمغ کتیرای قلیایی‌شده بر خواص نوری و مکانیکی اسناد کاغذی تاریخی. مجله صنایع چوب و کاغذ ایران, 9(2), 209-222. اعظم سهیلی پور; مهرناز آزادی بویاغچی. "تأثیر صمغ کتیرای قلیایی‌شده بر خواص نوری و مکانیکی اسناد کاغذی تاریخی". مجله صنایع چوب و کاغذ ایران, 9, 2, 1397, 209-222. سهیلی پور, اعظم, آزادی بویاغچی, مهرناز. (1397). 'تأثیر صمغ کتیرای قلیایی‌شده بر خواص نوری و مکانیکی اسناد کاغذی تاریخی', مجله صنایع چوب و کاغذ ایران, 9(2), pp. 209-222. سهیلی پور, اعظم, آزادی بویاغچی, مهرناز. تأثیر صمغ کتیرای قلیایی‌شده بر خواص نوری و مکانیکی اسناد کاغذی تاریخی. مجله صنایع چوب و کاغذ ایران, 1397; 9(2): 209-222. هدف این پژوهش، ارزیابی صمغ کتیرا، بهینه‌سازی و استفاده از آن به‌عنوان استحکام بخش جهت بازگرداندن مقاومت‌های استحکام و پایداری به اسناد کاغذی تاریخی می‌باشد. در این پژوهش محلول کتیرا با درصدهای وزنی مختلف تهیه شد و جهت بالابردن میزان pH، کلسیم هیدروکسید و جهت افزایش انعطاف پذیری، گلیسرول به آن افزوده شد. تیمار حاصل روی نمونههای کاغذی سه بار بوسیله اسپری دستی به میزان 5/3 میلی‌لیتر اسپری شده و سپس تحت کهنه‌سازی رطوبت- دما به شماره استاندارد 4706- ISIRI به مدت 12 روز کامل و کهنه‌سازی نور به شماره استاندارد ASTM D6789-02 به مدت 6 روز کامل قرار داده شد. نتایج نشان داد که pH نمونههای تیمارشده قبل و بعد از کهنه‌سازی نسبت به نمونه شاهد، به میزان 75/0 تا 2/2 واحد افزایش یافته و در محدوده قلیایی قرار گرفته است. آنالیز SEM، پیوستگی سطحی بیشتر الیاف را گزارش داد. ارزیابی مقاومت کششی نمونه‌ها قبل و بعد از کهنه‌سازی بیان کنندة افزایش مقاومت تا 15% بسته به میزان صمغ مصرفی بود. نتیجه آنالیز رنگ سنجی، قدرمطلق تغییرات رنگی نمونههای تیمارشده و نمونه شاهد را قبل و بعد از کهنه‌سازی 145/0 و 372/0 گزارش داده و عدم تغییرات رنگ و کدورت ماده استحکام بخش را اعلام نموده است. Soheilipour, A. and Azadi Bouyaghchi, M.., 2015. Reinforce of Papery Documents with Using the Nano Particles of Tragacanth Gum. Internal Patent No: 86531 (In Persian). Sequeria, S., Casanov, C. and Cabrita, E.J., 2009. Deacidification of paper using dispersions of Ca(OH)2 Nanoparticles in isopropanol study of efficiency. Translatore: Ataallah Sediqian. Restoration Science and Cultural Heritage Electronic Journal, 2:1-13. (In Persian). Weber, H., 1985. Conservation and Restoration of Natural Stone in Europe. Bulletin of the Association for Preservation Technology, 17:15-23. Emad, M., Gheibi, F., Rasuli, M., Khanjanzade, R. and Mohamadi jouzani, S., 2012. Medicinal, Industrial plants- Tragacanth Gum, 1st Ed., Peimane noandish, Tehran, 44-45p. (In Persian). Nayari, H., Fattahi, A., Iranpoor, M. and Nori, P., 2015. Stabilization of lactoperoxidase by Tragacanth- chitosan nano biopolymer. International Journal of biosciences, 6: 418- 426. Balaghi, S., Mohammadifar, M., Zargaran, A., Ahmadi, H. and Mohammadi, Mehrdad., 2011. Compositional analysis and rheological characterization of gum tragacanth exudates from six species of Iranian Astragalus. Food hydrocolloids Journal , 25: 1775-1784. Tang, L. C., 2001. Effect of Water Washing on Paper and Cellulosic Textiles: an Overview and Update of CCI Research. In: Presented at the Book & Paper Group Session, AIC 29th Annual Meeting. May. 30–June. 5, Dallas, Texas. Received for publication Fall 2001, 35-39p. Burgess, H D., Duffy, S. and Tse, S., 1990. In vestigation of the effect of alkali on paper. Journal of the American institute for conservation, The book and paper group annual, 9: 29-36. Bogaard, J. and M.Whitmore, P., 2001. Effects of dilute calcium washing treatments on paper. Journal of the American institute for conservation, 40: 105-123. Kolar, J. and Novak, G., 2004. Effect of various deacidification solutions on the stability of cellulose pulps. Restorator, 17: 25-31. Fazel. M., Azizi.M., Abasi.S. and Barzegar. M., 2012. Study of Tragacanth Gum, Glyserol and Oil on the features of food film based on potato starch. Food science and Technology Journal, 34: 97-107. (In Persian). Ranjbar, M., Bahrami, S.H. and Joghataei, M.T., 2013. Fabrication of Novel Nano Fiber Scaffolds from Gum Tragacanth /Poly (Vinil Alcohol) for Wound Dressing Application: In Vitro Evaluation and Antibacterial Properties. Material Science and Engineering Journal,33:4935-4943. Bahadori, R., 2007. 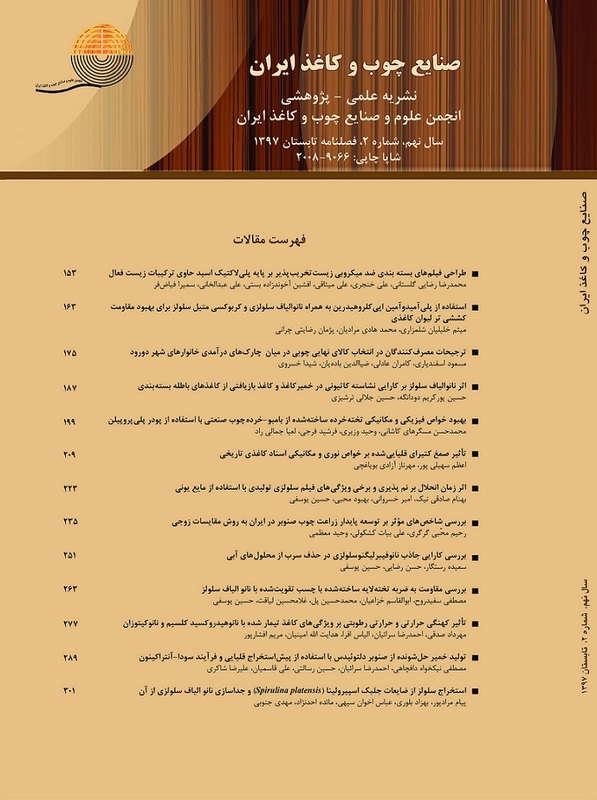 Organic Chemistry- Foundation and Application in Conservation and Restoration of Historical Objects, 1st Ed., Conservation and Restoration of Historical Objects Institute, Tehran, 110 p. (In Persian). Rezaierod, A. and Kameli, M., 2011. Rheological Studies of Silice- Tragacanth Suspensions. Journal of Macromolecular Science, 50: 1605-1614. Shahani, C., Hengemihle, N. and Weberg, N., 1989. The effect of variations in relative humidity on the accelerated Aging of Paper. In: Historic textile and paper materials II: Conservation and Charactrization, ed. Zeronian, S. H., and Needles, H.L. American chemical society symposium series.Washangton, D.C, p 63-80. Amal, H.A. and Samar H.M., 2012. Physical and mechanical properties of unbleached and bleached bagasse sheets after exposure to Ultra Violet light. Scholars research library, Archives of applied science research, 4: 1363-71. Dadmohamadi, K. and Azadi, M. 2016. Identify performance CMC rehabilitation and activated for preparations tissues used in restoration papary objects. Journal of Wood and Paper industry in Iran, Published online from Mehr 18. (In Persian). Khoobani.R, M., Azadi.B, M., Zolfaghari, B. and Dehghan, P., 2016. Antifungal effect of herbal extract Kabikag for conservation of the historical papery objects. Ganjineh Asnad Journal, 101: 104-123. (In Persian). Ansari, N., 2008. Principles and theories physical tests on fibers and textile, 1st Ed., Amirkabir University, Tehran, 83p. (In Persian). Keramati. M., Nosrati. B., Mohebi. R. and Abdous. M., 2015. Influnce of Role nanoparticles and coupling MAPP for physical and mechanical features in the Several structures made of waste paper/ Poly Poropilen.Iranian Journal of Wood and Paper industries, 7:193-203. (In Persian). Rahimi, S., Abbasi, S., Sahari, M. and Azizi,M., 2011. Characterization of an unknown exudate gum from Iran: Persian Gum. Food hydrocolloids Journal, 40:1-10. (In Persian). Thaise, C.F., Nunes,V., Rogovschi, A., Fabbri, J M. A., Sagretti, F K. and Hirashima, S F., 2013. Colorimetric Evaluation of Irradiated Red Beetroots. In: International Nuclear Atlantic Conference – INAC. Nov. 24-29 Sao Paolo, Brazil, p 152-156. Ariafar. A., Samanian. K. and Afsharpour. M., 2015. Optimization of CMC against microorganism factors with nanoparticles Titanium Deoxide using for promotion of this polymer quality protection in restoration of paper document. Ganjineh Asnad Journal, 25: 116-140. (In Persian). Afsharpour. M., T. Rod. F. and Malekian. H., 2011. New cellulosic Titanium Deoxide nano composite as a protective coating for preserving paper- art works. Journal of Cultural Heritage, 12:380-383. Imani, S. and Afsharpour,M., 2013. ZnO Nano- composite coating on the surfaces of historic and artistic works on paper. Restoration Science and Cultural Heritage Electronic Journal, 1: 39-47. (In Persian). Soheilipour, A., 2017. Assessment Zeta Potential and Size measurement of Persian Gum or Zodo for reinforce of the historical cellulose objects. In: Research Institute of Cultural Heritage, 12th annual Conference of conservation and restoration of historical objects. Feb. 23-24 Tehran, Iran, p 60-65. (In Persian).